CHICAGO, IL, December 08, 2017 /24-7PressRelease/ — Chicago’s Albany Park, Irving Park and North Park neighborhoods are bustling with a uniquely international holiday spirit. Home to the city’s most vibrant and diverse communities, the northwest side offers many businesses of diverse cultures. Albany Park is home to 40 different spoken languages and businesses rich in culture and customs. “The holiday season is the perfect time to experience our community,” says Thomas Applegate, Executive Director of the North River Commission. “Join us in celebrating traditions and cuisines from around the world.” Without leaving the city, you’ll find a taste of China, Serbia, Vietnam, Iran (Persia), Mexico, Brazil, the Middle East, Puerto Rico, Philippines and more with stops at the many wonderful businesses in greater Albany Park. Tis the season for ugly Christmas sweaters! Put on your most outrageous holiday sweater and head over to Irving Park’s Lizard’s Liquid Lounge on Friday, December 15 for an ugly sweater holiday party. “It’s a great chance to break out that silly sweater and get into the Christmas spirit,” says Liz Kavanagh, owner of Lizard’s Liquid Lounge. Enjoy drink specials and free appetizers from 8 p.m. until supplies run out. Additionally, the bar will celebrate NYE on a high note with DJ Bloodshot Scott, drink specials and free appetizers. Visit their website to learn more. Get into the holiday spirit with Brasa Roja’s annual Novena de Aguinaldos on December 17! A Colombian tradition, Novena de Aguinaldos is similar to Christmas caroling but includes prayers and food. Stop by for a prayer, favorite Christmas songs, snacks and homemade hot chocolate. View their menu online. Celebrate Christmas like they do “down under”. Templestowe is spreading Christmas cheer with a Secret Santa drawing and party! “People love this because it’s a great time, and you get to meet awesome people,” says John Sheahan, owner of Templestowe Pub. To participate, contact [email protected] or head over to the bar and sign up. Names are drawn Thursday, December 7 and the gift sharing party takes place on Thursday, December 21. There is a $15 gift maximum. Visit the website for more information. 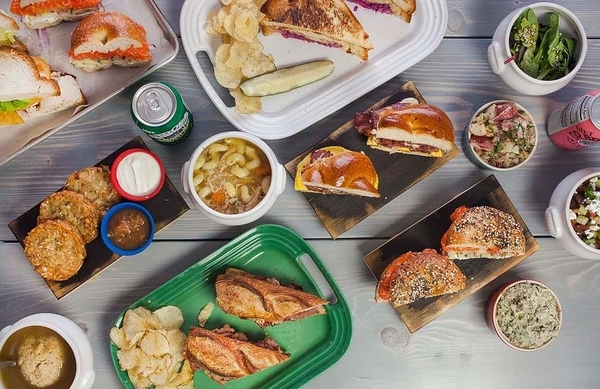 The popular Jewish deli is celebrating Hanukkah with eight days of deals! Steingold’s will have a different special each day of Hanukkah so be sure to follow the deli on Facebook, Twitter and Instagram for details on the daily specials. Hosting a big Hanukah party? Cater holiday favorites like Nanna’s Matzo Ball Soup, fish platter and latkes served with lebneh and applesauce. View the full catering menu online. Steingold’s is opening a second location next to the Francisco stop at 4642 N Francisco Ave. on December 12. No one celebrates Christmas like the people of Puerto Rico. Celebrations generally begin in early December and last until December 25. In addition to parranderos–the Puerto Rican version of Christmas caroling–and big parties, the holiday is celebrated with traditional Puerto Rican Christmas food such as pork, coconut rice pudding and coquito, a Puerto Rican eggnog. El Picosito Jibaro’s famous pork jibaritos are a delicious ode to tradition. Jibaritos are a quintessential Chicago sandwich snack originally created in 1996 by restaurateur Juan Figeroa. The sandwich substitutes two flattened fried green plantains slathered in garlic mayo for bread and layers meat, cheese, lettuce and tomato between them. View the full menu online. This restaurant brings a taste of Persia to Albany Park! On Christmas Day, Kabobi will be serving a traditional dish of turkey with vegetable stuffing, perfect for any gathering. Want to start 2018 with a flavor bang? Ring in the New Year at Kabobi with a special menu item–mixed superior white fish served with hummus Persian dill rice and Persian salad consisting of chopped cucumber, tomato and onion in an olive oil and lemon juice dressing. Visit the website to place an online order. In Mexico, Christmas means a whole season of celebrations, beginning with “posadas.” These processions take place on each of the nine evenings leading up to Christmas Eve and end at one house with food, drink and a pinata in the shape of a Christmas star. Traditional treats include tamales, bunuelos and Pan Dulce, sweet Mexican bread. Put a Mexican twist on your Chicago Christmas with Pan Dulce from Markello’s Baking Company! Follow them on Facebook. Christmas is the most important holiday in the Philippines, with celebrations lasting from December 16 to December 25. Filipino Christmas customs are a mixture of western and native traditions, so locals celebrate with Santa Claus, Christmas trees, Christmas cards and Christmas carols like Jingle Bells. However, traditional holiday foods include sweet ham, rice, flan and pancit, a traditional noodle dish. Cater your holiday party with Merla’s Kitchen. Party platters perfect for a Filipino Christmas include: Pancit Bihon, Leche Flan, Chicken Adobo and Lechon Kawali (pork belly). View the full menu online. Add a delicious European touch to your gifts for neighbors, teachers, mailmen, and everyone else on your list with a box of sweet treats from Cafe Beograd. Specializing in Serbian delights, customer favorites include gabon cake with raspberries and chocolate; cream puffs; baklava; and krempita, vanilla pudding. Visit the website for the full menu. Perfect party treats can be picked up at Feyrous Pastries, a Middle Eastern bakery and specialty grocery store. “Our most popular items are baklava, falafel, spinach pies and our special whole lamb,” says Mohammad Morra, co-owner of Feyrous Pastries. The lamb, available by pre-order, is stuffed with rice, meat, and pine nuts and feeds parties of 15-20. Stuffed lamb is one of the most well-known Middle Eastern dishes and in celebration of the holidays, the restaurant will be serving a special rice and meat stuffed lamb dish. Diners can also bring a piece of the Middle East home and order the special to go! Visit the website to see the full menu and place an order. Occurring in late January, Tet Nguyen Dan is the most important and popular holiday and festival in Vietnam, marking the arrival of spring based on the Lunar calendar. Meaning “Feast of the Very First Morning,” Tet Nguyen Dan is similar to New Year’s Eve in America and is celebrated by cleaning homes, visiting friends on the first day of the New Year and cooking special holiday foods. While customary dishes vary between regions, traditional foods include sticky rice cake, pickled onions, beef braised with cinnamon and spring rolls. Bring Tet Nguyen Dan to your home with LD Pho spring rolls! Mint, basil, vegetables and pork or shrimp are wrapped in rice noodles and served with homemade peanut sauce. Brazil salutes the New Year with one of the most festive New Year’s Eve celebrations in the whole world where locals head to the beaches for dancing and fireworks. While Chicago is too cold for a New Year’s Eve beach party, Brazilian Bowl’s catering brings that exciting Brazilian attitude to your NYE celebration. Party favorites include pastels, crispy empanada dough with choice of filling; coxinha, crispy potato dough croquette filled with shredded seasoned chicken; and Brazil’s national dish, feijoada, a stew of black beans, smoked sausage, bacon, rib meat, pork loin, Brazilian rice and collard greens topped with toasted yuca crumbs. View the full menu and place orders online. Food is the cornerstone of Chinese New Year celebrations. Dishes are steeped in symbolism, such as long noodles to represent longevity, dumplings for wealth, and whole fish for unity. Other traditional NYE food include spring rolls, mandarin oranges, and chicken. With restaurant favorites like Orange Chicken, Lollipop Chicken Wings and Hot & Spicy Boneless Wings, which come in half and full party tray sizes, Great Sea is the perfect place to celebrate the Chinese New Year, taking place February 16.